Thank you so much for visiting our baby registry! (We are also registered at Amazon). 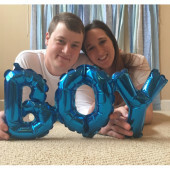 Baby McCamish is a BOY, but we are keeping the name a surprise. The nursery theme will be hiking, camping, mountains, and adventure. We are so excited to introduce you to our Little Moon!